See what it's like to spend a week in paradise at the Conrad Resort, Maldives. We swam with sea turtles, flew on seaplanes and had and incredibly indulgent time. Looking out the window of this small seaplane, that myself and 6 other people are on, I have officially become convinced that we are in the beginning stages of playing out that deserted island tropical fantasy that only seems to live on a screensaver. Flying over the Indian Ocean in the Maldives all you see is water so clear you’re trying to figure out if you’re looking at masses of coral or large whale sharks swimming below. The waters are that perfect shade of teal blue and as we fly over the atolls the small islands looks like an array of rings made from skipping rocks. How can this all be real, I silently ask myself - although based on the faces from the other passengers, I’m pretty sure we’re all thinking the same thing. Our plane gradually begins to dip and two small islands start to come into view. This already feels like paradise and we haven’t even touched ground. Neat rows of over-water villas line the shore, the palm trees seem to sway in perfect sycnhronization and the beaches have the whitest sand I’ve ever seen. Our plane gently glides to the long walkway, where a group of team members from the Conrad are waiting for us. Welcomed with cold towels and friendly smiles, it all sinks in. We really will be living inside a screensaver for the next week. Standing out as an iconic hotel, in a destination surrounded by over the top properties, all promising that same tropical getaway, is no easy feat. Yet somehow the Conrad Maldives seems to do just that. So don’t worry, we tested the waters for you, we tried the villas and we swam with the turtles all so you could get an inside look. 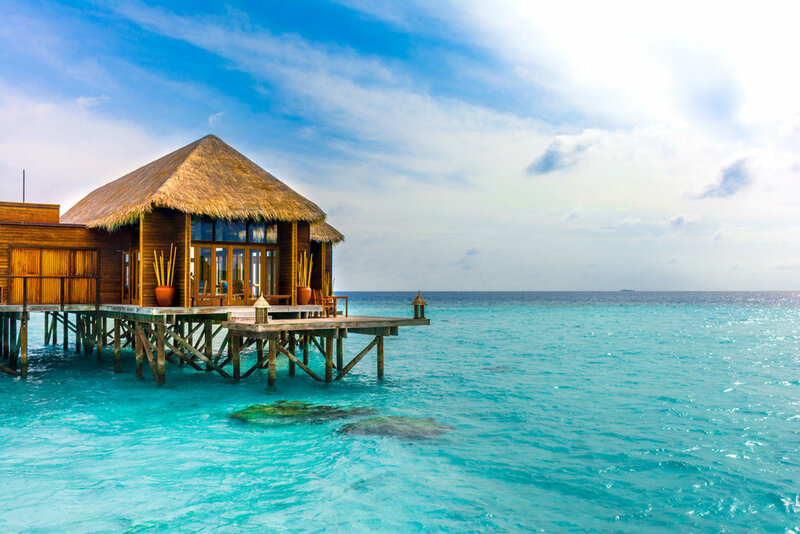 Visiting the Maldives is something that everyone should experience at least once in their lifetime. The beauty, the privacy, the exclusivity, and the remote location is the perfect setting for something romantic. You really are on a secluded island… except of course for all the modern amenities and amazing cuisine. Once you arrive at The Conrad Maldives and take one look around and you’ll truly understand what it's like to feel as though you are in the middle of nowhere. As far as you can see is bright blue water is all directions -- and except for the few people you may occasionally run into or the manta rays you see patrolling the bridge, you really are all alone. The resort itself is actually comprised of two islands, which are joined by a large bridge. The main island, Rangalifinolhu is best suited for families or large groups who want to be together, while the smaller and more intimate Ringali Island is geared towards couples who are looking for a romantic getaway in an over water villa. On the small, intimate Ringali Island, our over-water villa blissfully stood over the gentle turquoise waters of the Indian Ocean. The spacious villa was wonderful with no detail overlooked; It even had a glass bottom floor under the desk -- which offered a welcome distraction as we attempted (for a few minutes) to get work done. Floor to ceiling windows lead to our balcony which featured a plunge pool and lounge chairs, all overlooking the bright Indian ocean. The best feature was the small staircase off the balcony that provided a private entrance in the ocean’s shallow waters and gave us instant access to snorkeling or just swimming with the fish. For us, a perfect night was spent right on our balcony, sipping wine and listening to the gentle waves laps against our villa. Outdoor bathroom? Check! Deep soaking tub? Check! Large spacious terrace? Check! Private plunge pool? Check! The Deluxe Villa that we stayed in for the first few nights was absolutely amazing. If I had to imagine what my dream beach house would look like, this would be it. Surrounded by dense tropical plants with floor to ceiling windows and only steps from the beach, our villa was the perfect place to relax in total privacy. It may lack the drama of the over water villas but the seclusion and comfort make up for it. Despite the remote location, there is no shortage of amazing, creative and gourmet restaurants at the Conrad. With an astonishing 12 restaurants on the island to choose from, guests have their choice of dining from a gourmet buffet, beachside barbecues, a gourmet underwater restaurant, healthy yet incredibly satisfying dishes from the Spa Retreat, hot pots on the beach and so much more. Every meal was delicious and each restaurant we tried felt like we were getting into the hottest newest restaurant. Our favorite restaurant ended up being Mandhoo, the healthy yet hearty restaurant at the Spa Retreat, serving only organic and bio-dynamic gourmet cuisine. Perched on stilts above the ocean, the entire restaurant has an open air feel to it with cool breezes sweeping through and of course endless sea views. Apparently we weren't the only ones hungry for food. Come 1:30 groups of fish, sting rays and reef sharks begin gathering below waiting to be fed. We went back several times for lunch and dined on fresh Korean style seared tuna with bok choy, asparagus salad with truffle vinaigrette, roasted lamb filet with chili flakes and eggplant puree. If you're interested in a vacation in the Maldives, then I’m sure you’ve probably had a few massages in your lifetime. In fact, you may have even had some amazing spa experiences as well. But I’m going to bet you’ve never had a spa experience with endless views across the Indian Ocean, while reef sharks, stingrays and exotic fish swim at your feet. There are two different spasyou can choose from, The Spa Retreat or the Over Water Spa. For our first treatment we did a couples massage and then moved on to a Naturopath consultation all located at The Spa Retreat. Our massage was fantastic, they worked the kinks, fixed the knots and just made us feel good. Our Naturopath consultation was with the resorts resident Naturopath Christelle who delivers a holistic approach to reaching goals, whether it be detox, weight loss, or any type of malady you might be feeling. She preformed a bit of Reiki (which is the transfer of energy from one person to another) on us which was supposed to help destress and overall just make us feel better. Although I didn’t feel any radiance flowing through my body (or really much of anything) I did leave with a better understanding of my body and the importance of knowing what we consume. If you’ve never had a consultation with a holistic or Naturopath advisor, your should. It’s a fascinating experience and in our short visit, I felt invigorated and more knowledgeable…maybe the Reiki did work. From the moment we entered the Spa Retreat until we left, everything just felt fresh and relaxing. I suppose that’s the result of a great spa experience, you’re mind and body become blissfully in tune and everything is just better. Perhaps the greatest bathroom ever! The natural environment of the Maldives is the perfect haven for exotic marine life, so if you’re afraid of the water (like me sometimes) it’s time to get over it. This is definitely not the place to let your fears get the best of you. If you’re an experienced snorkeler or are comfortable in water, you can borrow some snorkel gear at the dive center to use for your entire stay. Or if you want to go with a guide and learn the basics (trust us it’s easy) you can take one of the several orgaizned excursions being offered. We spent the first few days dipping in and out of the surrounding water, snorkelling the house reef and also participated in one of the snorkeling tours. We set off to a remote island where we were able to snorkel around and see completely different underwater scenery. We even swam with a few sea turtles! Chris snorkeling around a deserted island. ...but if you snorkeling isn't your thing, yet still want to see all the beautiful marine life, just look over the water and guaranteed you'll see numerous specials wandering around. The long bridge connecting the two islands was the perfect place to spot manta rays, reef sharks and a few other exotic fish. Until our stay at the Conrad, I had never seen a manta ray in their natural habitat. One night as we were walking along the long bridge, we suddenly we saw a large mass dancing around. We rushed over to the light and sure enough, a pair of mantas were doing their dance. So keep your eyes open and know that staring into the ocean for long periods of time, can be quite rewarding. You never know what you're going to see. Sailing around a tropical island at sunset, drinking champagne, all while looking for dolphins, is about as romantic (and cheesy) as you can get, but definitely worth the adventure. We boarded one of the several luxury sail boats in the Conrad fleet, with a handful of other guests and set sail. The sky was changing colors, we were lounging on the deck and everything was going perfect…that is until big rain drops started falling. At first it was charming, you know a change in scenery and all, but eventually the winds got stronger andthe waters choppy. We darted as fast as we could under one of the decks and joined the others in trying to keep dry - a completely pointless feat…and right when the boat bounced over another wave and the look of nausea started to creep on several faces, a member of the crew started singing. Here we were in pouring rain, my motion sickness kicking in and this guy starts singing “Rain rain go away, please come back another day…” and it was perfect. Almost immediately everyone started chiming in and in mostly broken english, I’m pretty sure our singing could be heard from miles away. The storm did go away, about as quickly as it came and we were left with an incredible view of the sun setting over the islands. We didn’t see any dolphins, our luxurious lounging was replaced by battling flailing umbrellas, but in the end, this was one of the best parts of our trips. We laughed, we danced, we sang and we had fun! Make sure to check out the list of excursions available at Conrad and definitely give some though to a sunset cruise…you just might catch a storm and sing karaoke. Sailing around the Indian Ocean with canapés and bubbly! The thing about visiting the Maldives is that it can be a long process to actually get to your hotel or resort. Each hotel is located on a private island so getting there requires a seaplane transfer or speed boat…and that's all after you arrive at the international airport in Male, the capital city of the Maldives. Our flight from Singapore landed into Male at 11:30AM and we then had to wait for a seaplane transfer to take us to the hotel. Fortunately, we were greeted by a Conrad team member at the airport and brought to a large comfortable lounge to relax in while we waited for our transfer. There were large couches to sprawl out on, a delicious light buffet of snacks and plenty of drinks to choose from. When we finally arrived at Conrad Maldives around 4PM, completely exhausted, yet totally in awe.